In this episode, Jacquelyn Whiting tells us her story of burnout and teaches us a strategy she has used with students to find what she loves most about her career. She also emphasizes the importance of a PLN (Professional Learning Network) and how it has helped her to stay motivated and progressive in her practice. Jacquelyn has realized many things about herself and her colleagues in her 26 years of teaching/working as a Media Specialist. She has learned that burnout shows up in different teachers differently and that it is sometimes hard to identify. Although she thought that burnout showed up as grumpiness or “gruffness”, as she explains, her’s showed up as disinterest and she knew she needed to reevaluate her feelings. She shares with us her “But List” method to figuring out what she loves most about teaching and what is holding her back from truly enjoying it. She also shares her current outlet, which is blogging! The “But List” - Make a list of all of the things that you enjoy the most about teaching. Then, allow yourself to make a list of all of the “buts” that make those things unenjoyable. Decide what you can take action on and change, so you take as much control as you can over your situation. http://www.jwbeyondthestacks.blogspot.com/ - Jacquelyn’s blog where, when she writes, she finds that what she is doing in her career is way bigger than it seemed originally. 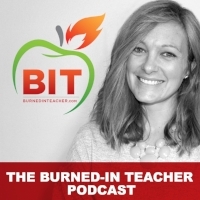 Go to HERE to learn more about my Burned-In Teacher EdTech and about my services offered or to read the Burned-In Teacher Blog to learn more.